Mulberry bushes prefer a temperate climate, but can be cultivated in a wide geographic zone extending from the Tropics to fairly cool climes. They are most widespread in the Far East (China, Japan, Korea, South East Asia), but are also found in South America (Brazil), the Near East and Europe (Greece, Italy, Spain and South East France). 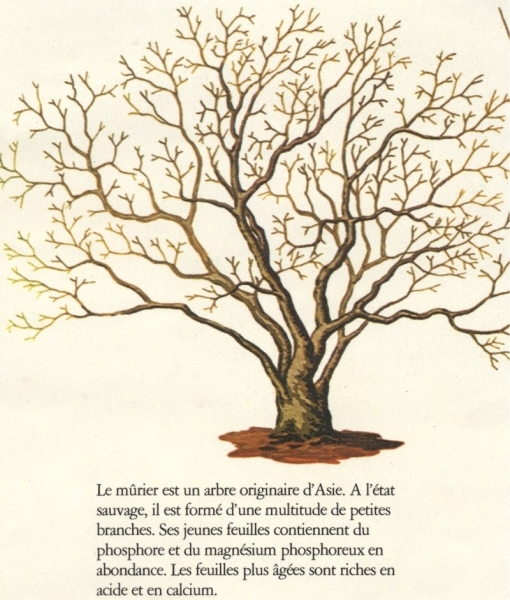 Soil type and favourable climate play a large role in the establishment of Mulberry bushes, of which there are 42 species. The principal species cultivated nowadays are Morus Latifolia, Morus Alba Linn and Morus Bombycis Koidz. 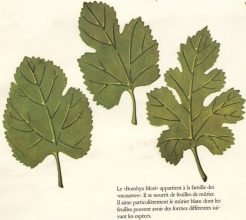 For good leaf production, the mulberry needs to have multiple branches and stems for rapid growth. The best leaf is medium sized, thick, dark green, and covered with a little down. Tropical regions situated 600-700 metres above sea level offer the best conditions for year long mulberry cultivation, with the possibility of 8 harvests instead of the 2 which are normal in temperate zones. 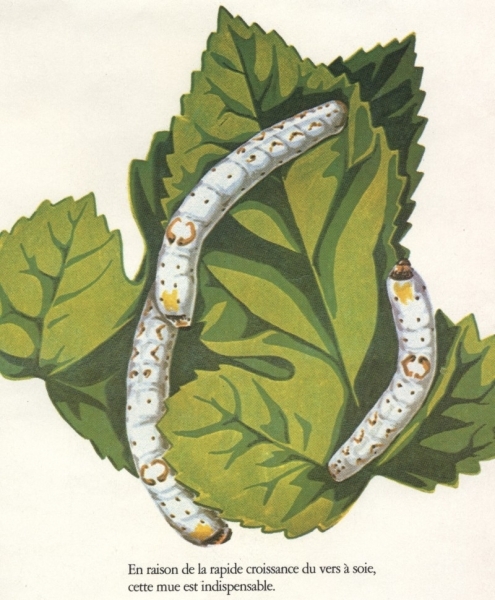 Barking dogs, crowing cockerels, foul smells can all upset the newly hatched worms. A silkworm out-of-step with the rhythm and moultings of the others has to be buried or fed to the fish to avoid any variation in silk-spinning. 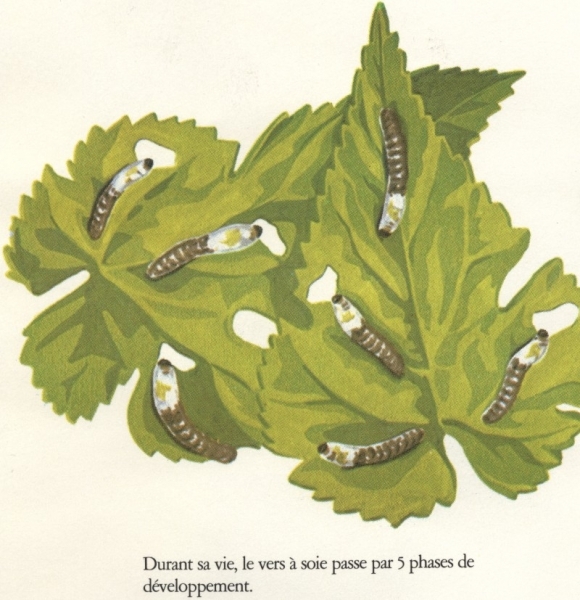 The larvae must be placed on dry mats. They have to sleep, eat and spin in harmony. The newly hatched worms have to be tickled with a feather in order to stimulate their growth. The surrogate mother of the silk worm must not have body odour. She must wear simple and clean clothes - and must not eat or touch chicory. The eggs have to be examined to ensure they contain totally healthy worms. 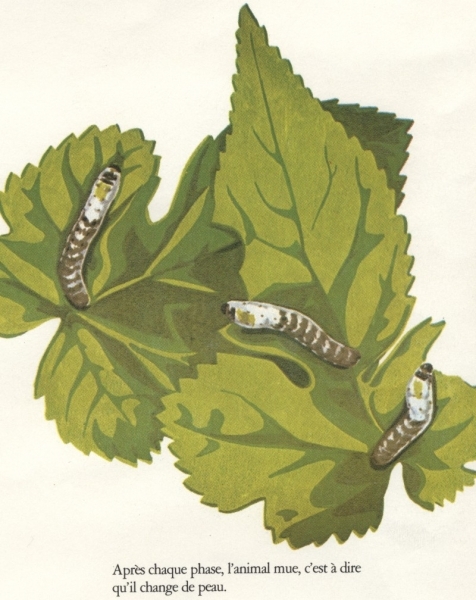 The silkworm egg has an elliptical shape and is small and flat, covered with a hard membrane. 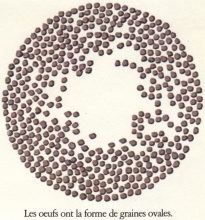 The shape and size of the egg vary depending on the speicies. Its colour is milky white or a single shade of yellow. There are two sorts of egg, hibernating and non-hibernating. Throughout the laying, the ideal temperature is between 23- 25 degrees Celsius with a humidity level of around 75%-80%. Eggs which are laid by mid-June and hatch at the beginning of May following are subject to strict conservancy rules. The silk worm is an insect with a four stage life cycle - egg, larva, chrysalis, and butterfly. The eggs hatch a fortnight after the start of incubation. 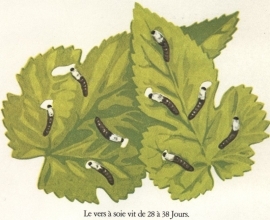 Larvae which are called Kego in Japanese mature after 4 dormant periods. Between each moult the worm is ravenous with hunger. 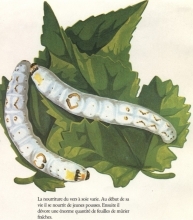 The life-span of the silk worm is about 25 days. Between its hatching and the time it spins its cocoon, its weight increases ten thousand fold and its size four thousand fold. After having eaten a large quantity of leaves during the first four life-stages, it stops eating at the fifth stage and attaches itself to a sprig of heather by a thread of silk which is ejected from a gland through a spinneret located under its lip. 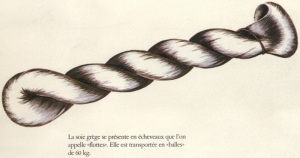 The diameter of this thread is around 30 microns and it takes 3,500 - 4,500metres to make one gram of silk. After 3 days, the worm metamorphoses into a chrysalis. 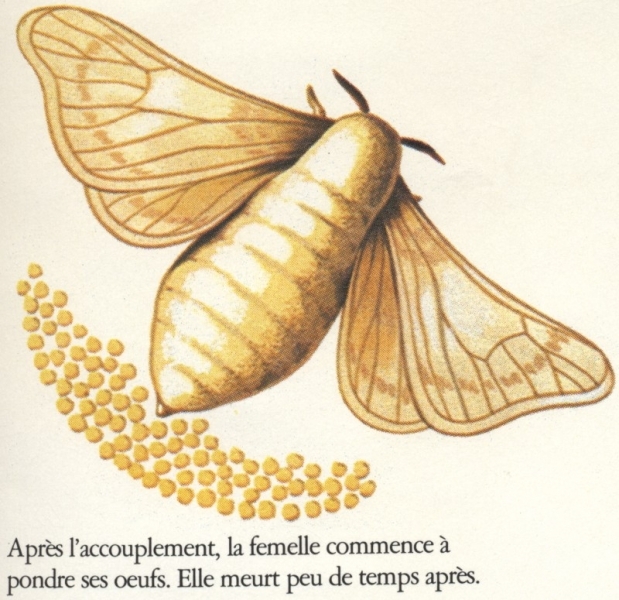 Ten days later the chrysalis becomes a butterfly, which in order to release itself has to secrete alkaline saliva to dissolve one end of the cocoon. Under a microscope, a thread of raw silk looks like a glass tube perfectly smooth and clear, with no irregularities at all. This absolutely regular structure confers on silk its smooth look and feel, its lustre and brilliance. Parts of fibres less well organized, called amphorae, gives silk its elastic quality, its solidity, fineness, lightness and suppleness. Silk is imperishable. It has a great absorbency which means it dyes easily. Silk can absorb up to 30% of its weight in water without the fabric feeling damp. This gives silk its quality of unrivalled hygiene and comfort. It also offers protection against heat, cold, humidity and sweat. This invaluable material can be electrically charged with the least rubbing in dry air, which means it is a perfect electrical isolator. On heating, silk burns and forms black, crumbly balls which smell of burning horn. Silk breaks down at 130 degrees Celsius and carbonises at around 300 degrees Celsius. A strand of conditioned silk stretches by 17% - 25% when dry and 30% when damp. 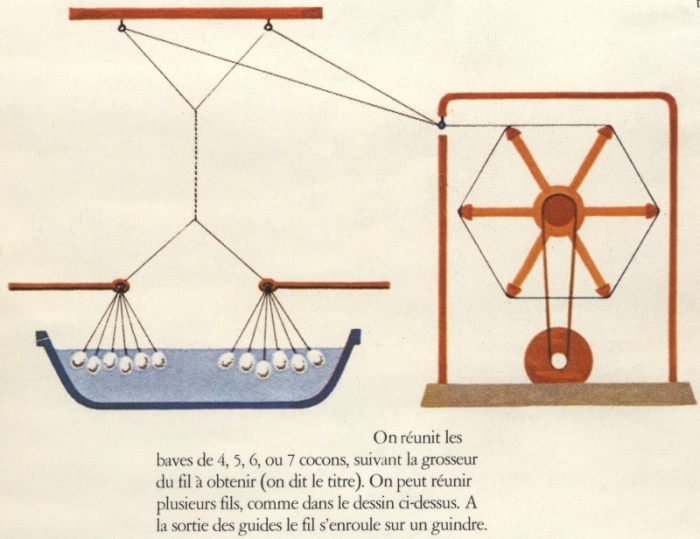 In each country, the silks are distinguished by their classification which designates in deniers the width of the thread. This system is used throughout the world. The most commonly used classifications today are 13/15, 20/22, 40/44 denier for raw silk destined for weaving, sewing thread and embroidery thread. Each classification is further graded: 6A, 5A, 4A, 3A, 2A, A, B, C, D, E, F, G etc. These gradings are applied to each lot after sorting in the country of origin. Grading depends on the regularity of the thread, cleanliness, neatness, variations in the lot, assays, breaking points, strength, elasticity, cohesion. The best system for grading silk is the Ulster Tester which provides assays with a 95% confidence level. This control system means that the number of grades can be reduced from 11 to 8. 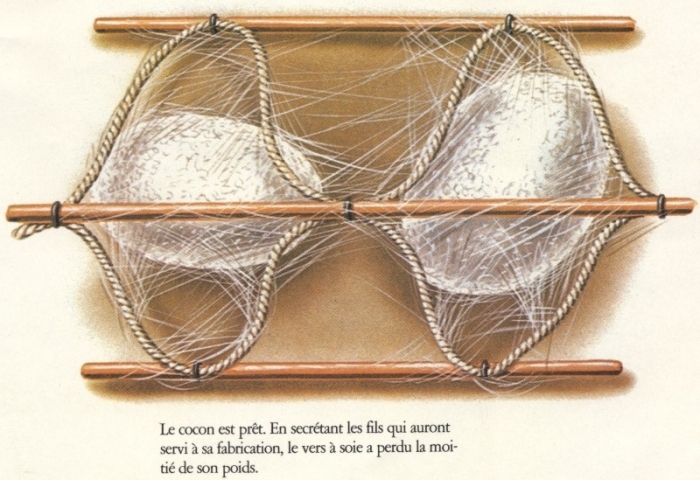 In order for the cocoons to be unravelled, they must be intact. 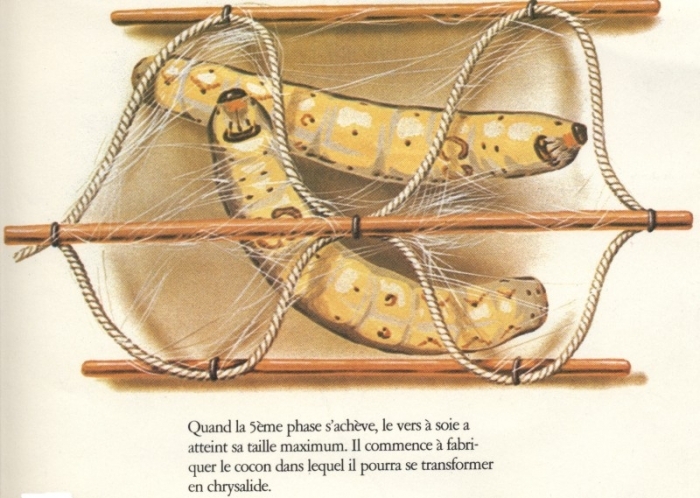 They are harvested before the chrysalis becomes a moth. The cocoons are placed in drying machines in which the chrysalis is suffocated by the heat. 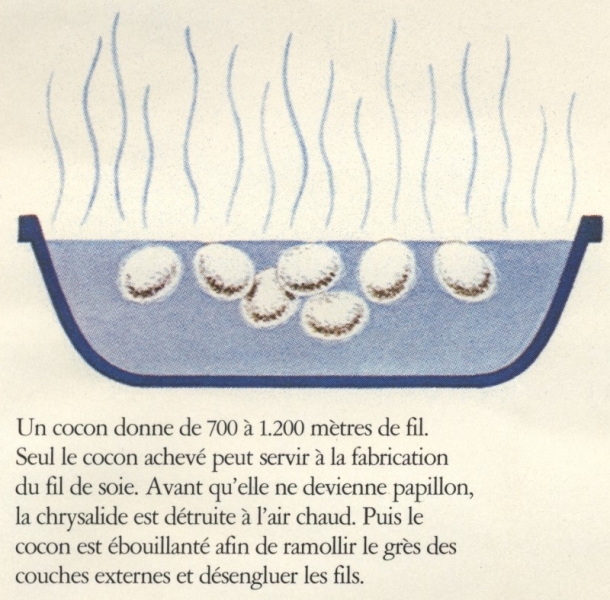 It takes around 6 kilos of cocoons to make a kilo of raw silk. 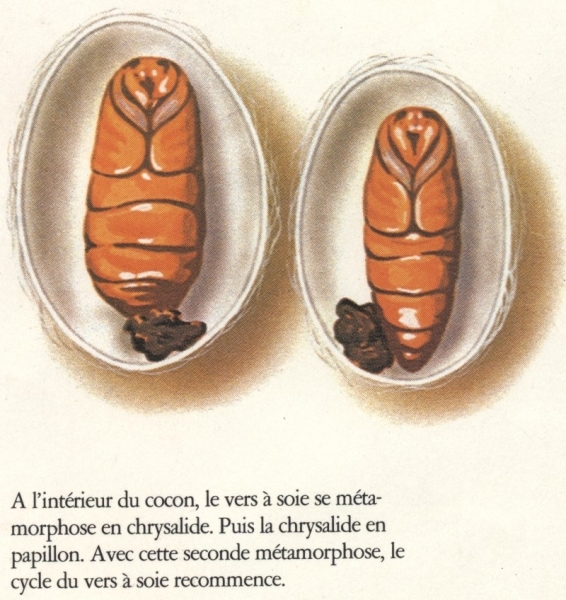 In the past, the external sericin covering was removed from the cocoon by plunging the cocoon into basins of water heated to 85-90 degrees Celsius. 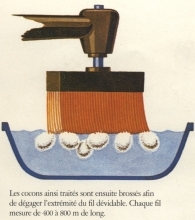 Each basin had 6 or 8 nozzles through which the silk was reeled. The charge-hand watched over the silken thread, feeding through thread from 4, 5 or 6 nozzles depending on the required thickness of the spun silk. Her job was to supply a new feed thread when the thread of one of the existing cocoons being spun either broke or run out. The consistency of the spun thread was down to the watchfulness and adeptness of the charge-hand. The Japanese resolved the entailed labour intensiveness of the spinning process by inventing a machine which automatically controlled the supply of thread. A special sensor attached to the end of each machine enables the automatic detection of thread when it runs out. 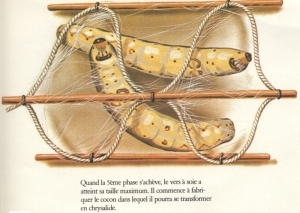 The operations following the boiling of the cocoons, are beating - to loosen the cocoon, remove loose external matter and locate the end of the thread. The threads from 4, 5, 6 or 7 cocoons are then brought together depending on the thickness of the desired yarn. The yarn when formed is given a slight twist to facilitate the aggregation of the threads and is then wound and separated into large hanks. Soaking destroys the gummy sericin which envelops the thread. The waste silk is put into colanders and then placed in vats heated by water and steam. After 2 to 6 days, the stuff is sufficiently broken down and, still at a temperature of 45 degrees Celsius to 50 degrees Celsius, it is moved through a tank of hot water and a tank of cold water before being thoroughly washed. 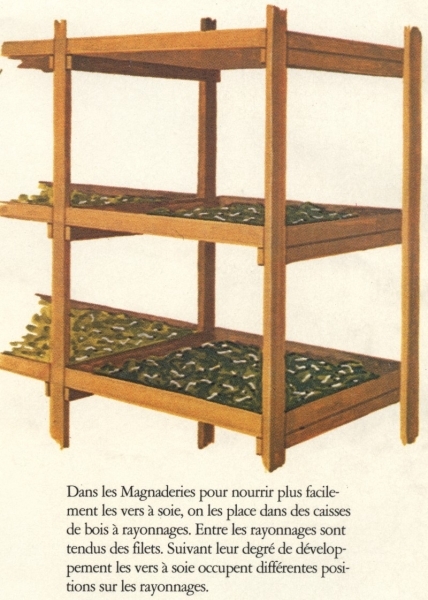 After this operation, the silk is dried, then plunged into s dilute solution of Marseilles soap, then dried again. The soaking process has largely been replaced today by another operation called ‘degumming'. 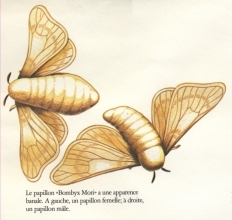 The treated material is next passed through a machine which opens the cocoons and distributes them into layers. These are then carded to eliminate impurities and fibres which are too short. The object is to retain only the longest threads. Dressing enables the alignment of threads and drawing creates a fine, long thread. This yarn is composed of fibres which, having no natural adhesion, has to be twisted slightly to make them cohere. Then it is spun to give the yarn the required thickness, strength and elasticity. The yarn is spun onto cones before being wound into skeins and is then ready for its final destination, whether it is weaving, milling or dyeing. Warping thread which is composed of several strands of raw silk twisted in the same direction - generally clockwise (100- 150 twists per metre). Organzine which is composed of two or three strands twisted in opposite directions to each other. The first thread is ‘S' twisted at 550 - 700 twists per metre, the second ‘Z' twisted at 475 - 600 twists per metre. Crepe which is composed of several threads given a strong twist of 2,000 - 3,500 twists per metre. ‘Ovalée' which is composed of 2 to 16 or more threads of raw silk, given a minimal torsion of 60 to 80 twists per metre. Grenadine which is organdie milled twice or more times to give a very strong twist. 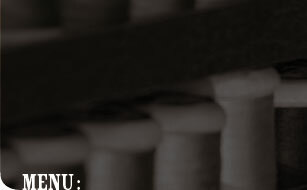 Cord made up of three strands each of several raw silk or silk waste threads twisted together in different directions. 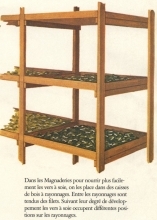 Mouline made up of several raw silk or silk waste threads twisted together with a medium torsion. Until the beginning of the 20th century silk was only dyed in hanks. 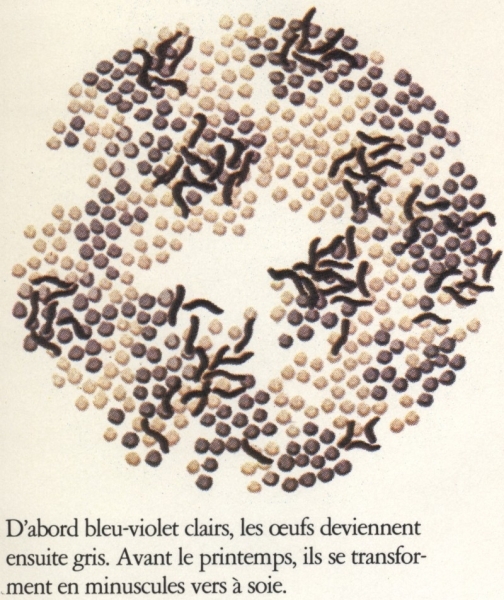 Thanks to inventions made in the 19th and 20th centuries, it became possible to dye pieces once they had been woven. Today, our silk threads for sewing, embroidery, canvas work and knitting are still dyed in hanks. Silk thread, owing to its chemical properties has a great affinity for dyes. Nevertheless, it is particularly sensitive to water containing carbonates and magnesium salts. Water is one of the greatest problems for dyers in our current world, since it is not as uncontaminated as it was in the past. 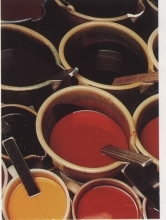 Traditionally silk dyeing was carried out in copper vats heated by a brazier. The problem was to keep the vat at a constant temperature. 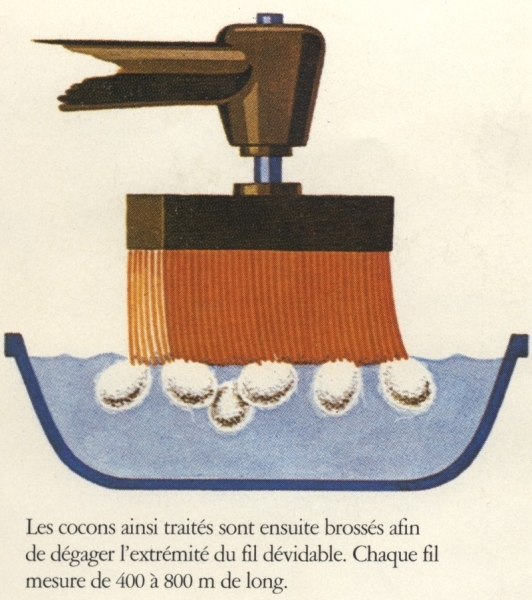 The hanks of silk supported by wooden rods were plunged into the vat of dye by the dyer who turned them regularly so that they took the dye uniformly. This method of dyeing in an open copper or stainless steel vat using wooden rods exists even today. Only the method of heating the vat has changed with the arrival of coal, oil or gas boilers. However, the development of equipment means that now dyeing can take place in closed vats where the hanks are steeped in a constant heat. 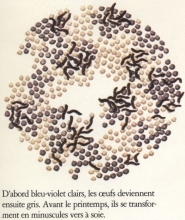 Some threads, such as warping threads, poil d'Alais, organdie are dyed in an autoclave. ISO standards correspond to domestic washing methods. 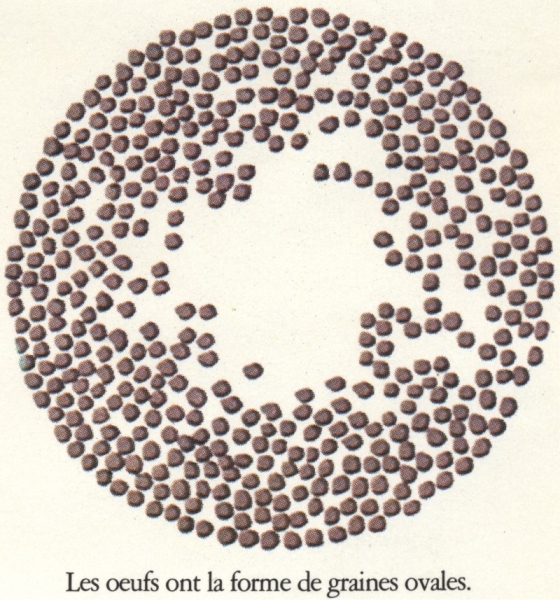 ISO 1 corresponds to washing at 40 degrees Celsius with 5 grams per litre of Marseille soap for 30 minutes. ISO 3 corresponds to a 60 degree wash with 5 grams per litre of soda powder for 30 minutes. For many years Au Ver A Soie has opted for very deep and vibrant colours for the second standard. Even though dyestuffs have made a great deal of progress and according to dyers no problem cannot be overcome, the fast dye does not exist. Considering the delicate nature of silk, the Commission for Technology and Research of the International Silk Secretariat in Lyon specifies that the washing temperature should not be more than 35 degrees Celsius.